The 13-week Music Friends Piano Piano classes are taught by Jenni LeGarde, and meets weekly in Russell Hall, on UNI’s campus. Music Friends offers a fun-focused blend of piano playing, basic rhythm/aural training, elementary music-reading, and music appreciation. This group class is an excellent option for the beginner student who is not yet taking private lessons, but is certainly not exclusive to first-time students! All students within the first year of study are encouraged to take part. The class will culminate with a performance on UNI campus for family and friends *Please note that Registration is not complete until all required registration and payment have been received. Jennifer LeGarde graduated in 2017 with her Master’s of Music degree in Piano Performance and Pedagogy from the University of Northern Iowa. 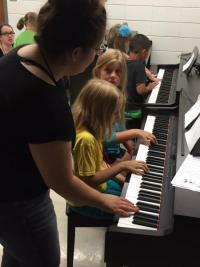 Her piano studio has consisted of students of all ages and she has been on staff with UNI’s summer program, Camp Musicmania. Jennifer supports each of her students’ innate and individual interests in music-making and fosters functional applications of musical skills. Materials: Level 1 Pack + Theory Book 1 materials from Piano Safari. Students will need to bring their kit to each class. Prerequisites: Students must be able to read letters (not words) and numbers. An acoustic piano (preferred) or keyboard with 88 keys and weighted touch is required for at home practice. To register, please visit the Music Friends Piano Program Online Registration page.